It is with great shock and sadness to announce that one of our greatest show supporters and breeder of note, Jeanine Grobbelaar, was found dead in her bed on 31 May 2015. We are trying to assist in finding homes for some of her Tonkinese cats. If you can assist, please let us know. 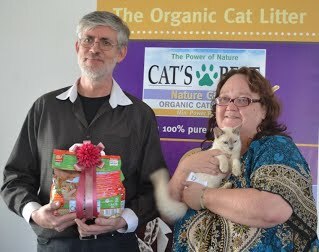 On this photo, she was with judge Johan Lamprecht at the Robertson show last year where her Tonkinese Apricot Point kitten, Loeloeraai Camden, won the CDCi Best in Show award.